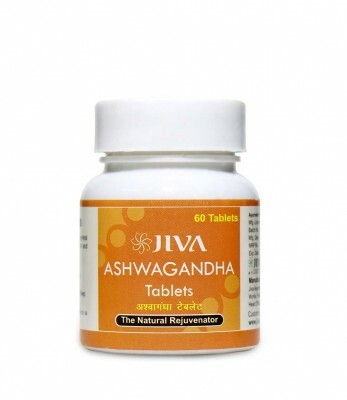 The Jiva Ashwagandha Tablet contains the Ayurveda herb, Ashwagandha, which has worked wonders with patients of cardiac and neural disorders for centuries. Physicians ancient and modern have acknowledged its rejuvenating powers. The tablet strengthens the nervous system and enables its users to handle stress better by elevating their stress threshold considerably. It is effective against hypertension and is also beneficial in renal complaints because of the diuretic properties of its ingredients. The natural origin of the ingredients makes it extremely safe for use and it works in tandem with other medication to heal you.